Our produce is a *WIndows* product that uses *Linux* containers. We'd love to test with Appveyor. Is this something Appveyor is going to be able to do? The last time I tried it was not possible, only WIndows containers were usable on Windows workers. We actually provide the solution during last year, please check this self-descriptive build. It requires more expensive build VMs (check "Quad" VMs on the billing page).But right now we are forced to re-design it because of many issues with have with Docker for Windows and nested virtualization. We plan to provide an alternative based on Windows Server 2019 and Docker EE. If you are interested in trying this new approach, let us know, we will include you in pilot, which should start in coming weeks. I thank you very much for the answer but am a little confused. You say that you already provide the solution, but also that it's not yet available? Please include us in the pilot! We'd be happy to pay a reasonable monthly for this, it would be great. However, I don't see anything about Quad VM on the pricing page, https://www.appveyor.com/pricing/, can you be more specific? It is available but we plan to discontinue it in favor of Windows Server 2019 based solution. Pricing page contains only very basic options, check account settings > billing in AppVeyor portal. E.g. https://ci.appveyor.com/account/<your_account>/billing. It has much more options. And thank you again for the quick response. Unfortunately, I seem to have opened this through github (it's open source, again we're happy to pay). 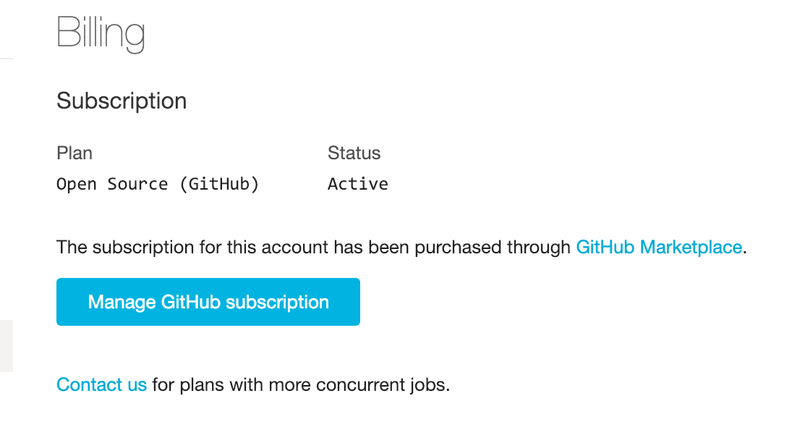 So since I opened it through github there's no info on the billing page, see attached screenshot. Feel free to change the account, or tell me what to do, thanks. I see, honestly we hesitate to provide this solution at the moment. We plan to move all Linux Container customers to new Windows Server 2019 VMs asap. We are right now preparing this. Is it OK for you to wait for couple of weeks? Yes, it's OK. We would dearly love to move our testing over to appveyor instead of managing machines on buildkite. You have me on the list for notification? Thanks! Please subscribe to technical updates at https://ci.appveyor.com/notifications and follow us on Twitter. If we decide to not advertise trial of those VMs with those channels, we will send you information separately. But subscribing to technical updates is useful anyway. New solution is ready for testing and your enabled for your account. Note that build start is typically about 3 minutes (time to provision VM on Azure). Note that image: Windows Server 2019 is essential to run build on those VMs. Thanks so much! We're looking forward to trying it out. Could I get it added to our account as well? @mikejolley: please provide your account name (or simple link to the build) -- I cannot figure it out using email you use in the forum. For your plan it will be Standard_D2s_v3 VM (details here) with 2 logical CPUs. 4-CPUs Standard_D4s_v3 goes with "Quad VM" plan (available on the billing page). It is right now in preview, your feedback is greatly appreciated. Thank you for pointing this out. Can you please try now? Thanks for the awesome help, I've mostly got things working. I'm always a little confused about what docker behavior I'm seeing. How does one find out about behaviors like this? Is there any workaround for this problem with volumes and options? That seems like a strange restriction, and so standard in the docker docs. Network creation also seems not to work? Docker is installed exactly as described this MS doc. As stated in Docker docs in Driver-specific options: "The built-in local driver on Windows does not support any options". Can you please describe the environment where it worked for you? Regarding network creation issue, can you please provide more detailed repro steps? I guess it may not be possible to do what needs to be done with Windows Server 2019. I'll give one more attempt by configuring a Windows Server 2019 with docker-ee myself to see if I can figure out what's going on here. We are working on the replacing it with Docker CE (backed by MobyLinuxVM) actually, which apparently have better functional for many scenarios, including your. Hope to release updated image this week. We use Windows Server 2019 Datacenter provided by Azure, if you are still interested. docker-ce would make me very happy. I'll look forward to the update.